Over 100 days at the end of 2008, Kevin Adams lost all of the wealth he had built up. His thriving business and investments were replaced by lawsuits and potential homelessness. This is the remarkable true story of Kevin's decision to depend entirely on the goodness of God to provide for him and his family. The Extravagant Fool is an underdog narrative. Readers will have a front row seat to Kevin Adams's breathtaking story---one that builds chronologically through a very difficult four-year period. At the height of financial success, Kevin Adams had it all. A thriving business with more work than he could get to, investments spread out between luxury homes, commercial real estate, and new business ventures. However, by January 2009, over the course of the last 100 days of 2008, Kevin watched in silent amazement as he lost it all. His house of cards came tumbling down. Kevin had a choice: Do what he had always done---work harder. Or, let go of conventional thinking and learn to live by absolute faith in God. With foreclosures, lawsuits, potential homelessness, and his family looking to him for immediate answers, Kevin took the radical position of stopping every effort to survive and resting instead at the feet of Jesus. The process of living literally by faith is a gamble and one that only The Extravagant Fool for God is willing to take. 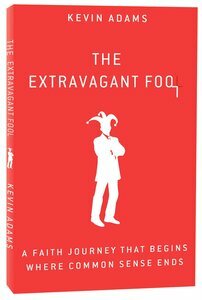 The Extravagant Fool is about encountering God with an uncommon intimacy. Intimacy increases our ability to discern His voice, which leads to the revelation of who we are, what we are to do for Him on earth, and finally, the provision to carry it out. Yet none of this really takes hold without first hearing the kind of living, breathing, testimony offered by The Extravagant Fool, a man who staked his welfare---and future---entirely on the goodness of God.